Dr. Paul MacCready repeatedly urged us to do more with less, getting big results from modest use of materials. That philosophy may be upheld yet once again by researchers from the Helmholtz-Zentrum Berlin (HZB) Institute of Soft Matter and Functional Materials. As reported here many times, people like Dr. Yi Cui at Stanford University, researchers at MIT, the Fraunhoffer Institute in Germany and many others are attempting to find the magic combination of ingredients that will allow us to transcend the weight penalty we currently trade for payload in heavier-than-desired electric aircraft. This precision allowed the team to see how lithium ions “migrate” into thin films of silicon – often the center of experiments to increase the energy stored in lithium batteries. Researchers determined the energy storage capacity of lithium-ion batteries “might be increased by six times” by using silicon instead of graphite in the anodes. Since 20 nanometers equals only 0.0000000787 inches, the material layer is extremely thin, and the materials needed to react with it are exceedingly small. Dr. Seidlhofero found two different zones on the test electrodes, with the action taking place close to the surface. 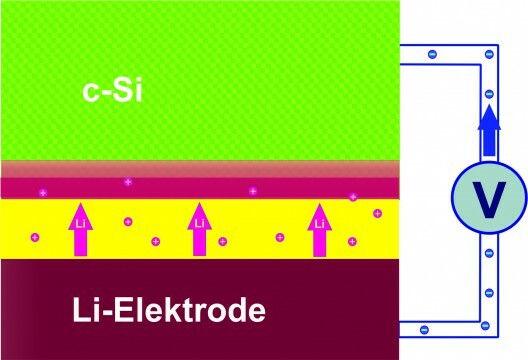 Near the boundary to the electrolytes, the 20-nm layer showed extremely high lithium content, with 25 lithium atoms lodged among 10 silicon atoms. A second, adjacent layer contained only one lithium atom for 10 silicon atoms. Both layers combined are less than 100 nm thick after the second charging cycle, according to researchers. Materials such as graphite used in many batteries can only “stably adsorb” a small number of lithium ions during charging. Silicon can adsorb many more ions, but tends to crack under stress. This stressing and relaxation eventually causes electrodes to crumble and batteries to fail. Other researchers have tried a variety of fixes for this problem over the last several years. In HZB’s testing, after discharging the battery, the team found about one remaining lithium ion per silicon node in the electrode’s silicon boundary layer exposed to electrolytes. The fact that most of the activity takes place at a surface level might prevent flexing and cracking at deeper levels, but that’s just your editor’s shallow surmise. Certainly a 6X battery, all that much lighter for the same level of energy, would be heaven-sent as far as aircraft are concerned. HZB’s findings are published as, “Lithiation of Crystalline Silicon As Analyzed by Operando Neutron Reflectivity,” in ACS Nano. Authors include Beatrix-Kamelia Seidlhofer, Bujar Jerliu, Marcus Trapp, Erwin Hüger, Sebastian Risse, Robert Cubitt, Harald Schmidt, Roland Steitz, and Matthias Ballauff.